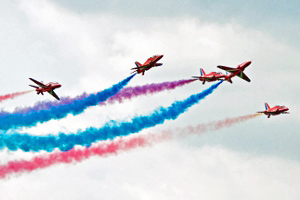 The Meteorologists got it wrong – the only Jet Streams were over Fairford! Weather has been the pre-occupation of flying enthusiasts since the first shows of 2012 were cancelled, in the early part of the season. 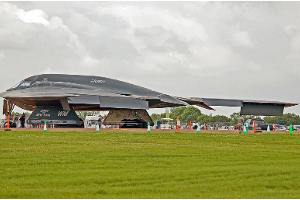 The biggest of all, RIAT, looked like a potential casualty and the Saturday was wet and cloudy which restricted many of the displays to low level and performance element reducing routines. Early on Sunday morning I set out for Gloucestershire and my heat sank as the visibility at Birdlip Hill was reduced to just a few yards. Heading towards Cirencester, and although the clouds still looked ominous, the rain stopped. As I approached Fairford village, the clouds were higher and I could have sworn I saw a few patches of blue sky! Arriving at about 8.30, I had expected to encounter the first traffic delays, but was pleasantly surprised when we were quickly directed into the airfield and on to concrete parking close to the main entrances – I had feared becoming entrenched in a muddy field and wading through the mire to the show site. I assume that many ticket holders had delayed their departure in order to catch the latest weather news before deciding to travel and this had prevented the usual queues. As I unpacked my camera gear, there were a few drops of rain which, moments later, stopped. And that, was the only rain I saw all day – until back at Birdlip, on my return trip, we encountered several heavy downpours. I had foregone the Lancaster and the BBMF, on this occasion, to avoid the delays that were expected as the crowds left after the show. The fact that so many spectators opted for a late arrival was good news. 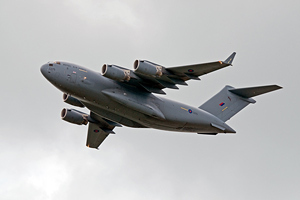 As flying was not due until 10.30, I had the chance to photograph many of the static aircraft whilst there was still enough space around the exhibits to avoid that photographers’ menace – the “can I stand in front of your camera man” – a species known to inhabit airfields and air displays! The static aircraft were spread over a considerable distance, so I took the easy option and decided to learn about stealth technology and marvel at the UFO parked nearby. 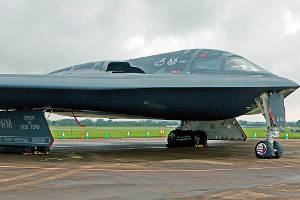 Now, I have seen videos of this B2 Spirit flying and the two US Air Force personnel present assured me that it does, indeed, fly! I will believe that when I see it with my own eyes. Access or close examination was not on the agenda, which, I assume is why two of Gloucestershire’s finest, equipped with HK sub-machine guns, were patrolling the area. 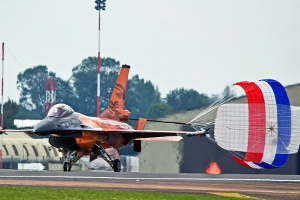 We all saw “Broken Arrow” and we know John Travolta is a licensed pilot – but was he expected at Fairford for another attempt? I vowed to keep my eyes open, just in case! 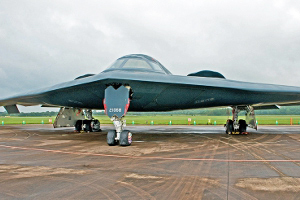 The Stealth Bomber is certainly an aircraft to marvel at and it is easy to see that it must have led to the creation of numerous UFO reports before it was ever disclosed to the world. I walked the whole length of the static display area. 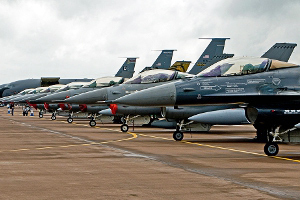 The number and types of aircraft were varied and an enthusiasts dream - though I soon understood the relevance of Ian Grigg’s 2011 Review comment - when he mentioned the abundance of F16’s. 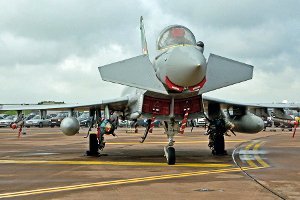 This year’s tattoo was the same – although, of course, it does illustrate how successful some aircraft are and just how many have been supplied to many different countries. With the improvement in the weather the concrete and tarmac were fine. The grass areas, however, are traditionally bumpy and the previous week’s rain had turned much of it into mini wetlands. So, some care was needed, but that was a small price to pay for the chance of a full days flying. The crowds were still slow to appear and, so, securing a suitable spot on the spectator line was easy. Let the flying program commence and, what a program it was! 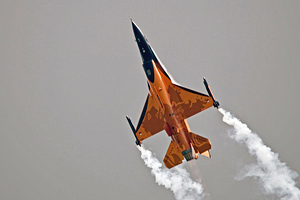 With around 8 hours’ non-stop flying, there would be little point in merely listing the aircraft. Far easier on the reader just to pick out what were some of the major highlights of the show. 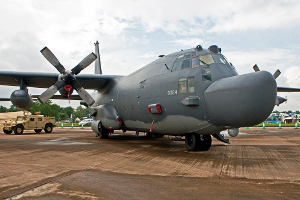 That does not detract from all the aircraft and companies who participated at RIAT, this year, but the list of aircraft can be found on-line and there is little point in duplicating that just for the purpose of this Review. 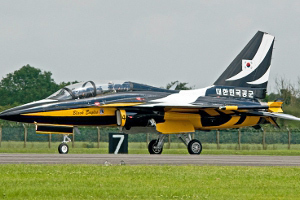 We have been hearing, for some time about the South Korean Air Force Team, the Black Eagles with their black, white and gold liveried KAI T-50B aircraft. 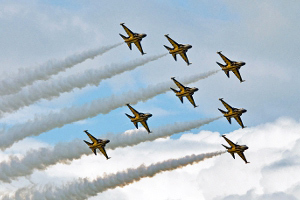 All I can say is, “Watch out, Reds, these boys are better than good, they are world class!” To a background of Korean music, informed commentary and RT transmissions, the crowd were treated to a fantastic display of precision aerobatic flying which was every bit as exciting as you will see from any team, anywhere in the world. 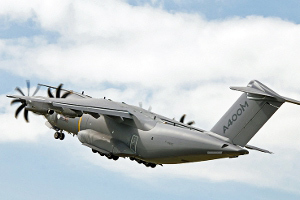 The impressed crowd gave the team an ovation and were still applauding when the team returned to their aircraft stands. Other team displays including the UAE, also contributed with some fine flying though there was a definite and discernable difference between them and teams like our own Red Arrows and the Black Cats. 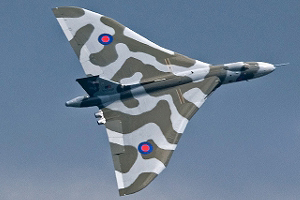 Now, if there was one aircraft that has totally won the hearts and affection of the UK, it’s the Avro Vulcan. Recently, she had to have two engines replaced – no mean feat in a 50 year old aircraft and not a cheap piece of engineering to complete – she didn’t display on Saturday so today was her first display proper for some time. 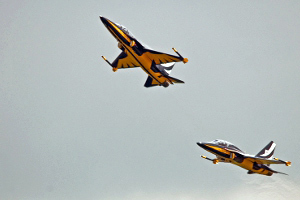 She may have looked sparkling with her new coat of paint but she still sounds the same – even with two new engines – and, as usual, the display was immaculate and stayed within the tight display parameters as easily as some of the so-called agile fighters of today. 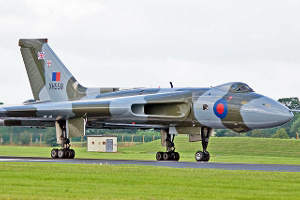 Make no mistake - she is back and that beautiful Vulcan whine made sure that the whole world knew it! 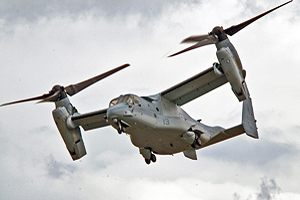 Another unusual aircraft, the Boeing Osprey gave an interesting demonstration when it tilted its engines to 80 degrees for an aircraft type take off. 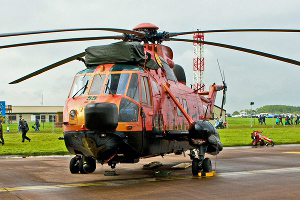 It takes only a mere 12 seconds to change the rotor and engine angle to enable the helicopter hover capability and land vertically. 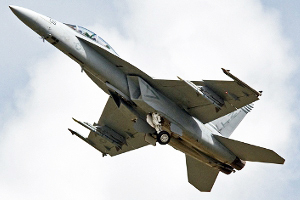 The aircraft has already been used operationally recovering a downed marine pilot. 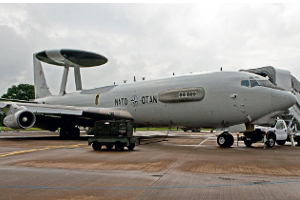 A new Wing of this aircraft is due to be stationed in the UK, in East Anglia. 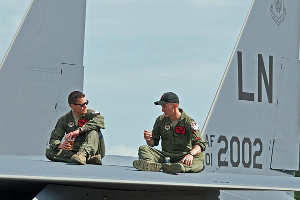 The beauty of RIAT is the continuous displaying of aircraft – how many T1 and T2 Hawks have you seen flying? Like myself, dozens! 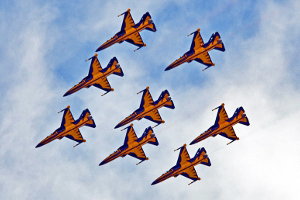 But, have you ever seen 29 Hawks flying in a “EIIR” formation. 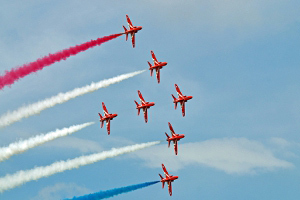 We were treated to a re-run of the Jubilee Fly Over – only one pass, but as it takes many nautical miles to get the formation into position and over 90 nautical miles just to execute a turn with that many aircraft, the single flyover was no surprise to the delighted crowd. 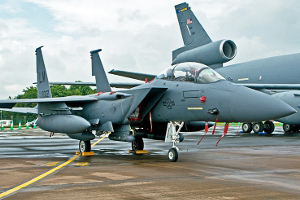 We were treated to fine displays from the Rafael, the F15 and the F18 so at RIAT, if noise is your “thing” there is always plenty of pressure on the ear drums. Unusually, despite the noise, I don’t think I heard a single youngster crying or screaming – good business for the ear plug sellers probably! 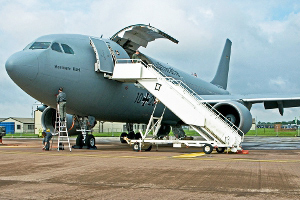 We are soon to the see the end of the VC10’s service with the RAF but the gap has been well plugged with the arrival of the next generation of transport and tanker aircraft. 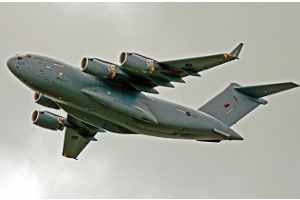 The new aircraft flew line astern intermingled with the C130’s and the Galaxy. 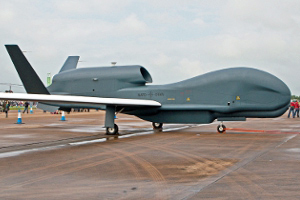 Depending on numbers and operational commitments, it seems that these aircraft will take over the mantle of earlier types and will provide the logistical support needed in operational theatres. 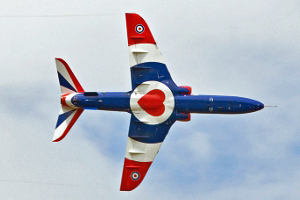 Another noteworthy display was the newly liveried Hawk – dressed from head to tail in the Union flag, she also carries a heart in the centre of her underside – great display which showed off the Jubilee paint scheme to real effect. 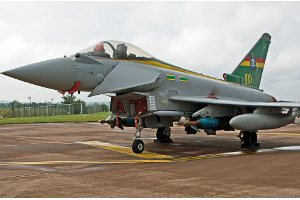 Other European air forces use bright colour schemes on their aircraft – any chance of a brightly coloured UK Typhoon I wonder? Lord Coe missed some free advertising there and what a photo opportunity if the Typhoons had carried decals of the 5 Olympic Rings! 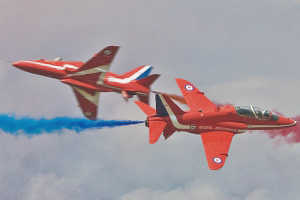 The Red Arrows thrilled as always – even though reduced to a 7 ship configuration this season, they still lead the way when it comes to precision aerobatics. The singletons impressed with their opposition roles and the performance was of the polished standard we have come to expect from them. 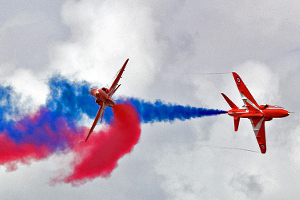 Quite rightly, the Red Arrows continue to thrill the crowds and certainly are the “best of British”. One runs out of superlatives to describe this team. Suffice to say that, once I had enjoyed the performance of the Reds, I was able to start my homeward trek and leave before the inevitable departure delays. 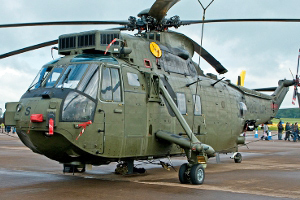 RIAT has something for everyone. It is a pity that so many people missed out because of the weather on the Saturday and I think that, despite the much improved Sunday weather, the numbers were well down on previous years. 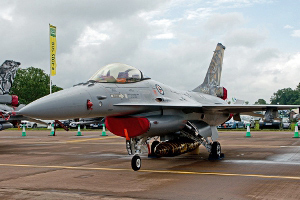 It is not cheap to go to RIAT - although the free entry for under 16’s helps family visitors – but the show offers the biggest and, perhaps, the best. General catering prices are reasonable but I would still say that travelling light is not the way to go. Take your own food and plenty of drinks – RIAT then becomes excellent value for money. It remains to be seen, of course, whether prices will be frozen again next year. 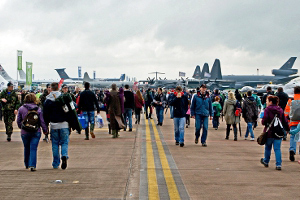 Sunday was a great day out for all ages and all the family – see you at RIAT in 2013!